For anyone who knows me I have always been a relatively active person. I was a dancer for over 10 years, I was a cheerleader in high school and I have been know to have participated in the occasional "fun run" of 5 km. Since having my kids however, I have put on a total of 50 lbs since my wedding day and when we were weighing the kids the other day out of curiosity, my husband stood on the scale and I then realized that I am exactly 100 lbs heavier than him! Now I know that the number on the scale is not always the important thing, but society has other plans for women. I looked in the mirror that night and really looked at myself...you know that kind of scrutiny that you can only give yourself and I thought, "who is this person"? I mean, my bottom is way larger and sticks out much more than it used to, I have the mummy tummy (yes I have 3 kids and I know where it came from but I still don't like it) - I am thankful that I didn't get "twin skin" (that extra flap of skin that just won't go away), my breasts have gone up 3 sizes (I used to be a 38C) and they sag. I just don't like the way I have looked and I have decided that I need to take matters into my own hands and do something about this. The weight won't just disappear as much as I would love it to, so hard work is going to be in my future. First step is get a workout video that I can do at home as I can't readily get out to a gym and I really don't want to pay the fees. The boys still nap in the afternoon, so I have dedicated that time as "me time" and will work out then. 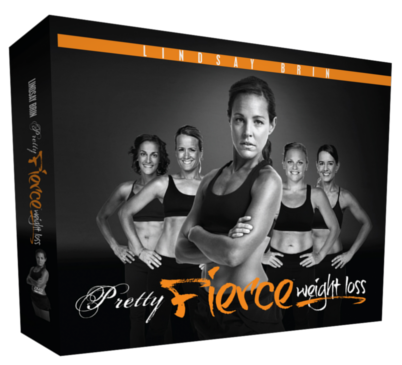 Last week I got a great deal on the Pretty Fierce Weight Loss workout series by Lindsay Brin and have printed the 60 day schedule for my workouts. I sat down this morning and planned my meals for the week. So here goes for my weight loss journey...this is a 60 day program and I am going to do my best to stick with this and work hard for me. Awesome - sounds like you have a great plan in place. Yes, good for you for making a plan and sticking with it. (That second part is where I struggle the most..... you know, the "sticking to it" part.) For the record, you look really good, and you carry your weight well! How are you doing on this? Is it working? Intrigued.... And I am with Jo. You look good!